The hard work and collaboration of the Mental Health Street Triage Team has been recognised in NHS Lambeth Clinical Commissioning Group’s first Lammy Awards held to recognise the contribution of individuals and teams supporting excellent health and care services in the borough. The team won the ‘working together’ category at a special ceremony at the Imperial War Museum recently. 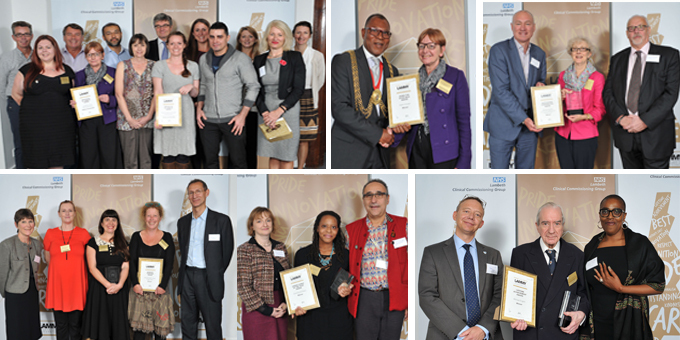 The Living Well Collaborative was Highly commended in the Innovation in Lambeth category, along with the Tissue Viability Specialist Nursing Team from Guy’s and St Thomas’ NHS Foundation Trust. The winners were Breathe Arts Research, which uses arts and magic to work with children with hemiplegia (a common motor disorder) and delivers England’s largest hospital-based performing arts programme to Guy’s and St Thomas’ hospital to reduce patient anxiety and improving the working environment for staff. The collaboration brings together SLaM (South London and Maudsley NHS Trust) the Department of Health, the Mayor of London’s Office for Policing and Crime, NHS England and the Metropolitan Police Service and was set up to ensure that the experience of people facing a mental health crisis can be improved and police involvement reduced. Victoria Glen-Day, clinical service lead for Lambeth Crisis Service receiving the award from a delighted Matthew Patrick, SLaM’s Chief Executive and Sue Gallagher (CCG governing body) said: “I am so very proud of the team and their dedication, we had the support of a number of service users and peer supporters who offered their insight and support to a project that confronted what is often seen as a difficult interface between service users/police and staff. There were nine Lammy awards which attracted 84 nominations. The ceremony was hosted by Dr Adrian McLachlan, CCG chair and Andrew Eyres, chief officer. Another SLaM endeavour, The Psychology in Hostels project (PiH), led by Dr Emma Williamson, principal clinical psychologist and clinical lead, was highly commended in this category. The service is a partnership with Thames Reach (Homeless Charity Accommodation and Support Provider), London Borough of Lambeth Adult Community Service commissioners and Guys and St Thomas’s Charitable Trust. The PiH ‘works together’ to create an integrated holistic service offering tailored to meet the needs of the most complex homeless people in Lambeth. It is felt that the partnership nature of the project has been fundamental to its success in working with the most excluded users and preventing further homelessness. The audience was moved by the incredible story of Corinthia St Peters, who won the Unpaid Carer of the Year Award, which was presented by Helen Charlesworth-May, Strategic Director of Commissioning Strategy at Lambeth Council and local authority representative on the CCG’s governing body, and GP Dr John Balaz, also on the CCG’s governing body. The judges heard how 18 year old Corinthia has been looking after her mother, father, grandfather and uncle for the past 10 years. When Corinthia was eight her mother was diagnosed with cancer, her father and grandmother suffered a stroke and suffered from long term conditions. Corinthia had to grow up fast and became a carer to all of them, moving between living with her mum, gran and uncle in Balham and her dad in Streatham, depending on who needed her the most. This meant she pretty much dropped out of primary school to nurse them through a variety of treatments. This involved washing, dressing and feeding them as well as being the eyes of her uncle who had become blind. At one point Corinthia ended up virtually living in King’s College Hospital while both her mother and father were being treated there on separate wards. Her mother died in 2010 aged 39 but Corinthia continues to look after her father and grandmother. Corinthia, from Balham, is now on an 18-month clinical engineering apprenticeship at King’s College Hospital learning how to operate hospital equipment. I was totally surprised and honoured to receive an award for Going the Extra Mile. I feel this award is for all those who have worked alongside and supported me in the Lambeth Living Well Collaborative (including all those wonderful Vital Link, Missing Link and Solidarity in a Crisis peer supporters and carers). Also it’s for the Loughborough Farm volunteers and Herne Hill Road Medical Patient Participation Group, including the wonderful Bernadette (Practice Manager) and June Johnson (receptionist) who won the Kindness Lammy award. It is when you encounter people like Nicola Kingston who won The Outstanding Contribution Award, and veteran health campaigner Michael English, presented a Lifetime Achievement award, that you realise that you still have a long, long way to go. Nicola was presented with her award by Lambeth councillors Jim Dickson, Cabinet member for Health and Wellbeing (Herne Hill ward), and Councillor Robert Hill. Her role with SLIC is an extension of her work with the Lambeth Patient Participation Group Network where she is vice-chair. She was previously chair of Lambeth’s Local Involvement Network (LINk). She shares the CCG’s vision for health services that are people-centred, prevention-focused, integrated, consistent and innovative. Highly commended: Liz Clegg, Assistant Director Integrated Commissioning (Older Adults) for NHS Lambeth CCG and the London Borough of Lambeth. She demonstrates determination and passion every day in her role as a commissioner of services for older people in the borough and Catherine Pearson, Chief Executive of Healthwatch Lambeth. She has lived in Lambeth for 26 years and has worked hard to establish Healthwatch Lambeth as an exceptional organisation involving patients and carers to help improve local services. Michael English’s Lifetime Achievement Award was presented by Councillor Jacqui Dyer, vice-chair of the Overview and Scrutiny Committee of Lambeth Council, and Labour councillor for Vassal Ward, and Andrew Eyres, the CCG’s Chief Officer. The veteran politician and health campaigner who is 84, is a true patient champion. He was Labour MP for Nottingham West from 1964 until the seat was abolished in 1983 and is a former Lambeth councillor. He has lived through the establishment of the NHS, was a member of the Lambeth Community Health Council and helped found and later chair the Lambeth Local Involvement Network (now replaced by Healthwatch Lambeth). He continues to attend all of the CCG’s governing body meetings and actively participates in discussions and debates on health and social care within the borough. Highly commended: Dr Cathy Burton, a retired Lambeth GP and Lambeth CCG’s former Clinical Lead for Cancer and End-of-Life Care. Dr Burton has helped develop care pathways, and provided leadership and support to local GPs to enable early referrals of cancer. Also Dr Ruth Wallis, Joint Director of Lambeth and Southwark Public Health. She is passionate about better health and wellbeing and reducing health inequalities.